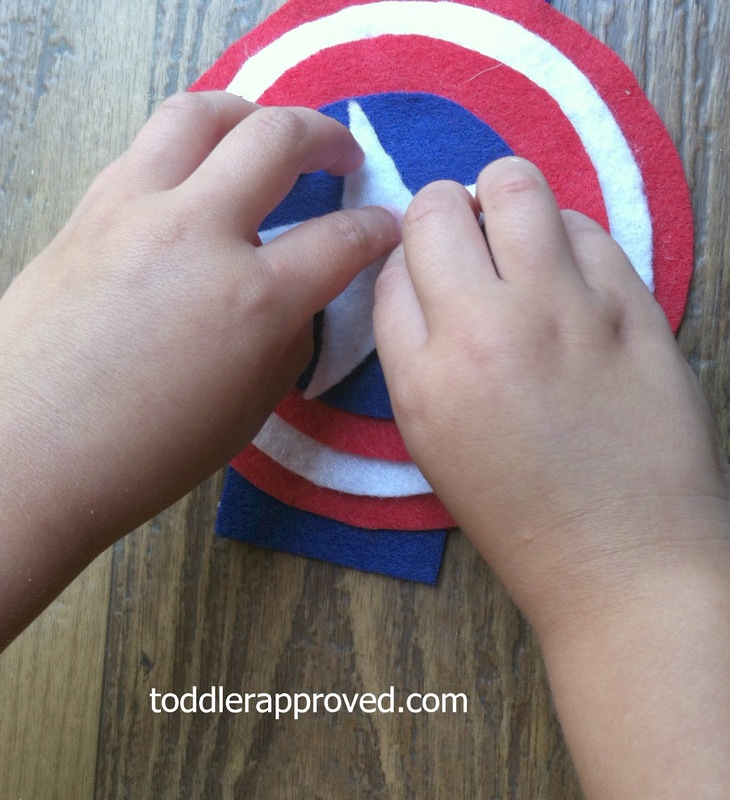 Captain America is THE favorite superhero in our house lately - so I knew that the leftover red, white and blue felt from our "stringing stars project" would eventually turn into something inspired by him. 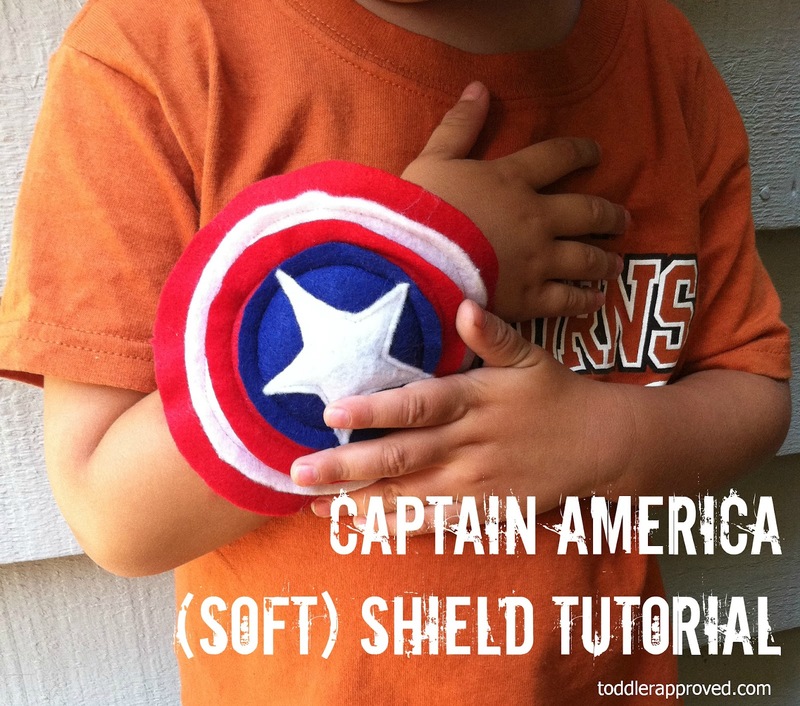 This "shield cuff" has been wrapped on my sons wrist from the moment I took it off the sewing machine, and all breakables (and people) in the house have been spared during his "avenging" in and out of the house because it is soft and made of felt. 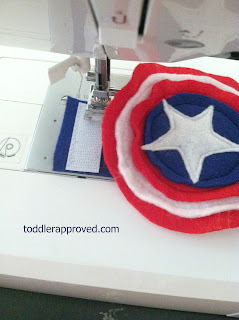 Ready to make one for your little Captain America? Don't know how to sew or have a machine - don't worry - I've included instructions on how to do this project "no sew" as well. 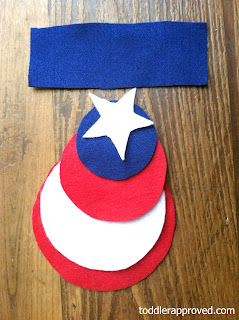 Using shield template pieces, cut out corresponding pieces of felt. In addition to template pieces, you will also need to cut out a rectangular piece for the cuff - 2" wide and about 8" long from the remaining red felt. 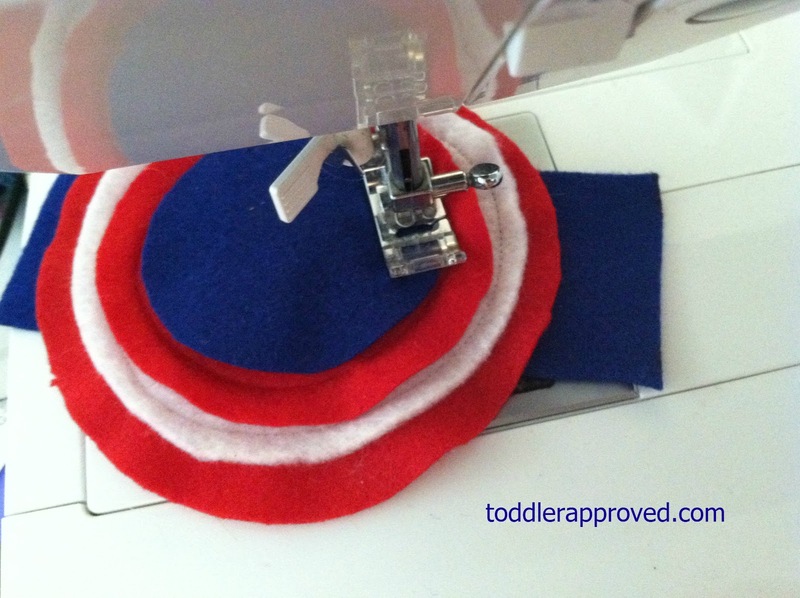 Cut two parallel slits (as pictured above) in your largest red circle wide enough for the cuff band to slide through. Do NOT slide cuff band through yet. Sew circles on top of each other one at a time from largest to smallest. 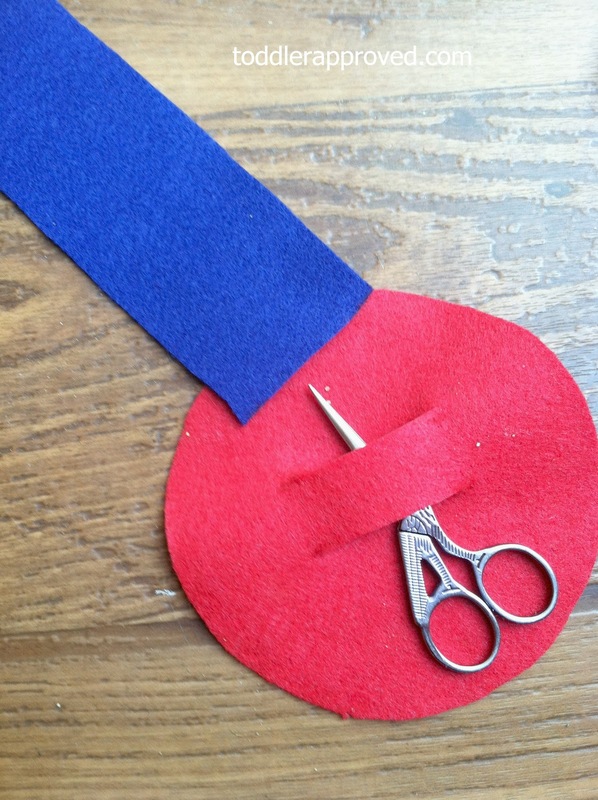 ***Before you sew on the blue circle, slide the cuff piece in through the back. Sew on the remaining blue circle and star (this will also secure the cuff band to the shield. Lastly sew a piece of Velcro on each side of the cuff. 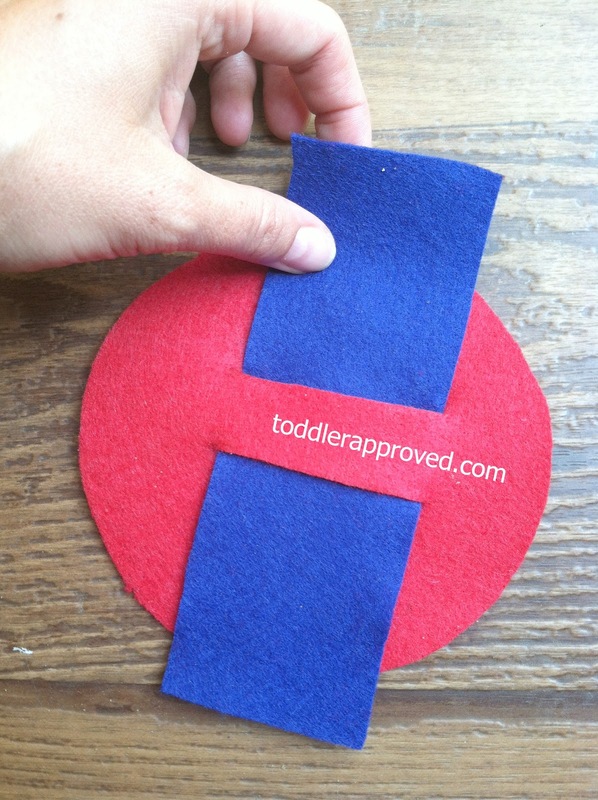 Using shield template pieces, cut out corresponding pieces of felt as follows: Cut out the largest red circle on the NON sticky back felt. From the sticky back felt cut out the 3 remaining circles and star. Cut two parallel slits (as pictured above) in your largest red circle wide enough for the cuff band to slide through - and slide the band through. Adhere sticky back Velcro to each end of cuff (on opposite sides so that it will actually close). 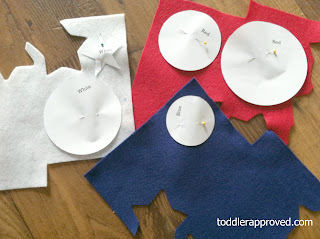 Remove sticky backing from each remaining circle piece and adhere on top of each other from largest to smallest. Finish by sticking star in center of shield. Awesome tutorial! 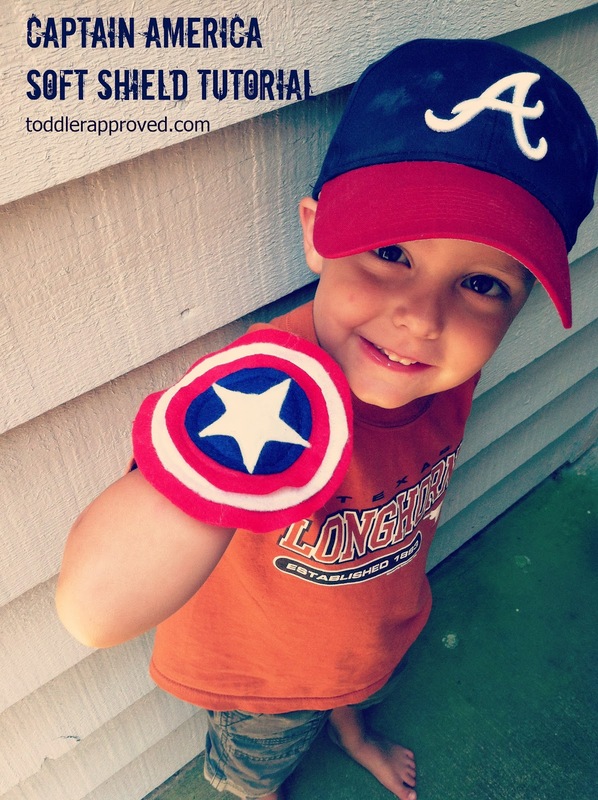 My boys are both really into super heroes right now and would love these! Thanks for the tutorial. I just made my son a captain America t-shirt. He'd love this to go with it! When you have completed this soft Captain America shield following these easy steps, then all you need to complete your perfect Captain America outfit is the Captain America leather jacket!